Note: If this would be your first sesshin at ZMM, please call the Training Office at 845-688-2228 to arrange for an interview before registering. Our August Sesshin is the only meditation intensive that must be joined for the full week. 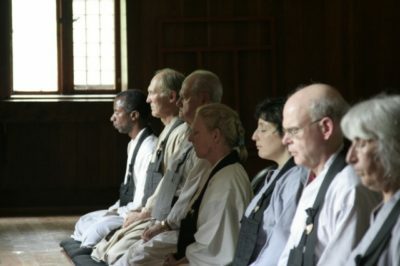 Those who have never participated in sesshin before or who are newer to Zen practice should plan on attending one of our other monthly Sesshins for the Thursday-Sunday portion of the retreat. Shugen Roshi Geoffrey Shugen Arnold, Roshi received dharma transmission from Daido Roshi in 1997. He is head of the Mountains and River Order and abbot of both Zen Center of New York City and Zen Mountain Monastery. He has been in full-time residential training since 1986, before which he studied music and mathematics. His teachings have appeared in various Buddhist journals and in The Best Buddhist Writing 2009. Hojin Sensei A Zen priest, Jody Hojin Kimmel, Sensei received transmission of the Precepts from Daido Roshi, who began the process in 2009, and from Shugen Roshi, who completed the transmission in 2012. In 2017, she received full dharma transmission from Shugen Roshi. She currently serves as MRO training coordinator and co-Director of the Zen Center of NYC. Before entering the Monastery in 1990, Hojin Sensei studied fine art and trained under legendary ceramicist Toshiku Takaezu, among others. Over the years she has taught drawing, ceramics, and painting, and continues to teach on the creative process within the Mountains and Rivers Order.